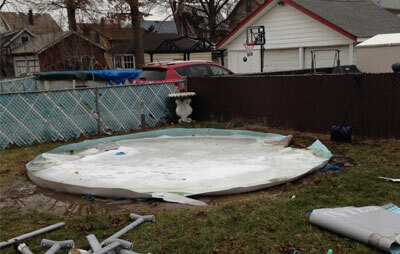 Are you renovating your home and need an immediate above ground pools removal in New Jersey? Then you are on the right track. With 1-844-JUNK-RAT, your home is in good hands. Geared with the latest equipment in demolition, 1-844-JUNK-RAT is a local junk removal company professional junk haulers in New Jersey can remove your above ground pool and eliminate the remains so you don’t have to. Round or oval, there is no pool that we cannot handle. Best of all, you won’t have to do anything during the process. Just lead us to your above ground pool and we’ll do the rest. Our demolition service in New Jersey will not cost you a fortune. In fact, we only charge for the space your trash takes up in our spacious truck. If you book a demolition service today, we will give you instant free estimates. After agreeing with the price, we will start on your above ground pools service straight away! 1-844-JUNK-RAT is a local junk removal service in New Jersey company that’s committed to 100% customer satisfaction.